Get your Copay Savings Card by text to start saving on prescriptions with the EUCRISA Mobile Savings Program, for eligible patients. 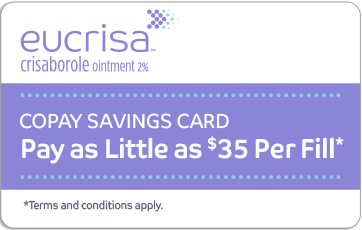 Sign me up to receive the EUCRISA Copay Savings Card via text message. Once enrolled in EUCRISA Mobile Savings, you will be sent an e-card via text message to use at the pharmacy. *I agree to the Terms and Conditions of the EUCRISA Mobile Savings Program and agree to receive autodialed text messages from or on behalf of EUCRISA at the wireless telephone number provided above. I understand that this is not a condition of purchase or use of EUCRISA or of any Pfizer product or service. 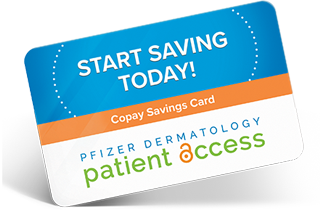 By opting into the EUCRISA mobile program, in which you can receive your Copay Savings Card via text, you consent to receive up to 10 text messages and/or push notifications per month from Pfizer Inc. Such messages may be marketing or non-marketing messages and may include, for example, refill reminders, fill confirmation, website information, etc. T-Mobile is NOT liable for delayed or undelivered messages. To stop receiving text messages, text STOP to 42762. DOING SO WILL ONLY OPT YOU OUT OF THE EUCRISA (CRISABOROLE) MOBILE PROGRAM; you will remain opted in to any other Pfizer Inc text message program(s) to which you separately opted in. You may unsubscribe from the digital wallet message Program at any time by disabling push notifications or removing the digital wallet pass from your device for digital wallet programs. To request more information or to obtain help, text HELP to 42762. You can also call customer service at 1-800-725-4125. You represent that you are the account holder for the mobile telephone number(s) that you provide to opt in to the texting program. You are responsible for notifying Pfizer Inc immediately if you change your mobile telephone number. You may notify Pfizer Inc of a number change by re-enrolling in the program. Message and data rates may apply to each text message sent or received in connection with the texting program, as provided in your mobile telephone service rate plan, in addition to any applicable roaming charges. Charges are both billed and payable to your mobile service provider or deducted from your prepaid account. Pfizer Inc does not impose a separate fee for sending text messages. Data obtained from you in connection with this Short Message Service (SMS) texting program may include your telephone number; your carrier’s name; and the date, time, and content of your messages. Pfizer Inc may use this information to contact you and to provide the services you request from us. The service is available only on these US participating mobile carriers: Verizon Wireless, Sprint, Nextel, Boost Mobile, T-Mobile, AT&T, Alltel, ACS Wireless, Bluegrass Cellular, Carolina West Wireless, Cellcom, Cellular One of East Central Illinois (ECIT), Cincinnati Bell, Cricket Wireless, C Spire Wireless, Duet IP (AKA Max/Benton/Albany), Element Mobile, Epic Touch, GCI Communication, Golden State Cellular, Hawkeye (Chat Mobility), Hawkeye (NW Missouri Cellular), Illinois Valley Cellular (IVC), Inland Cellular, iWireless, Keystone Wireless (Immix/PC Management), MetroPCS, Mobi PCS, Mosaic Telecom, MTPCS/Cellular One (Cellone Nation), Nex-Tech Wireless, nTelos, Panhandle Telecommunications, Pioneer, Plateau, Revol Wireless, Rina-Custer, Rina-All West, Rina-Cambridge Telecom Coop, Rina-Eagle Valley Comm, Rina-Farmers Mutual Telephone Co, Rina-Nucla Nutria Telephone Co, Rina-Silver Star, Rina-South Central Comm, Rina-Syringa, Rina-UBET, Rina-Manti, Simmetry Wireless, South Canaan (Cellular One of NEPA), Thumb Cellular, Union Wireless, United Wireless, U.S. Cellular, Viaero Wireless, Virgin Mobile, West Central Wireless (includes Five Star Wireless). You agree to indemnify Pfizer Inc and parties texting on its behalf in full for all claims, expenses, and damages related to or caused in whole or in part by your failure to notify us if you change your telephone number, including but not limited to all claims, expenses, and damages related to or arising under the Telephone Consumer Protection Act. Pfizer Inc may suspend or terminate your receipt of text messages if it believes you are in breach of these SMS Terms and Conditions. Your receipt of text messages is also subject to termination in the event that your mobile telephone service terminates or lapses. Pfizer Inc reserves the right to modify or discontinue, temporarily or permanently, all or any part of the text messaging services you receive, with or without notice. Pfizer Inc may revise, modify, or amend these SMS Terms and Conditions at any time. Any such revision, modification, or amendment shall take effect when it is posted to Pfizer Inc’s website. You agree to review these SMS Terms and Conditions periodically to ensure that you are aware of any changes. Your continued consent to receive text messages will indicate your acceptance of those changes.